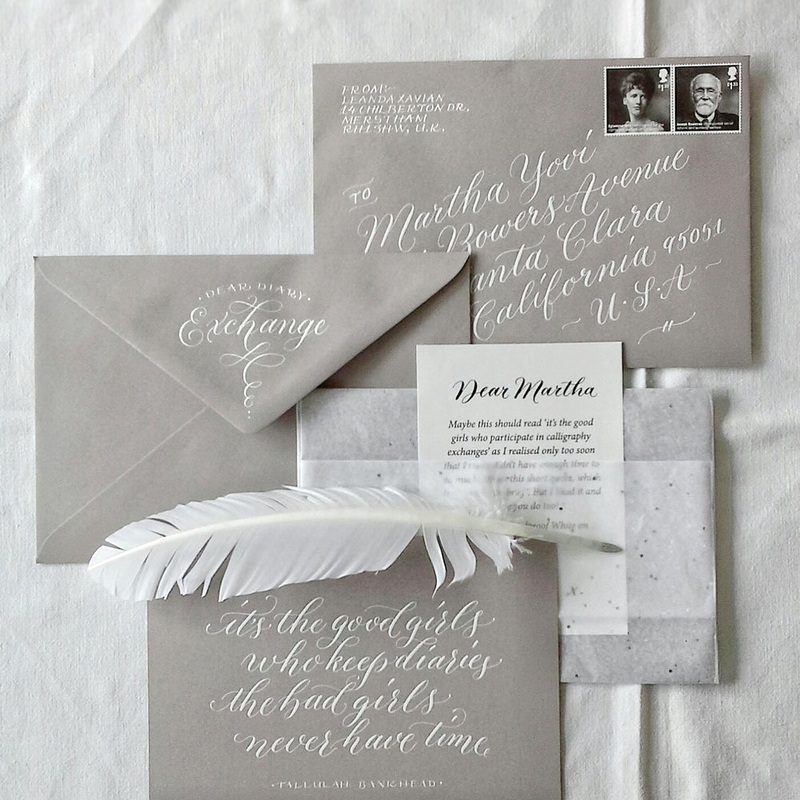 Leanda Xavian is the calligrapher and lettering arts teacher behind The Fine Letter Co. Having spent the early part of her career as a print graphics designer, Leanda entered the calligraphy community with a well-trained eye for letterforms and layouts. From pointed pen to ruling pen, Leanda's work expresses a delicate, airy, carefree style. This is no surprise when you learn that fiber arts – knitting and crochet – are among her other creative passions. She describes herself as being "drawn to really delicate crafts," a sentiment which shines through even in her boldest lettering work. 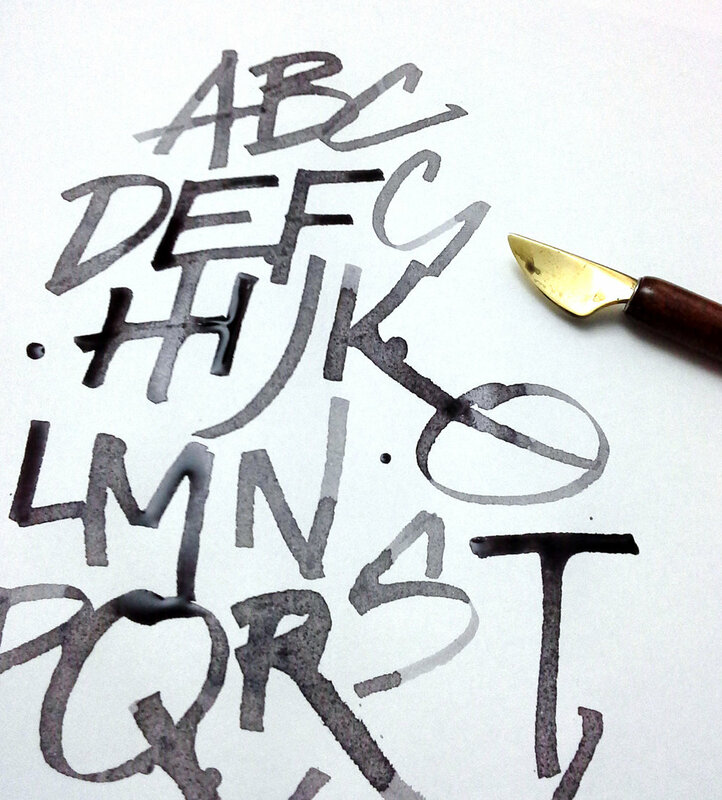 Leanda is also a teacher of modern calligraphy in and around her home of Surrey, England. Head over to her Workshops page to sign up for upcoming classes, and join the mailing list to learn about new ones. I conducted an interview with Leanda via email to find out about her creative background, what she learned when starting her business, how she combats creative block, her favorite hobby, and more. What is your creative and artistic background? I’ve drawn since I could hold a pencil! I remember at school, when I was about 8 years old, that there was a fierce rivalry between myself and a boy called Roland as to who was the best drawer in class. Almost inevitably, I ended up going to art school, but had to drop out after my foundation year due to lack of a grant. I moved to London and embarked on a shambolic few years working in various creative fields, anything that would fuel my creative needs. But I always had a yearning to be a graphic designer and after years of plodding away on my own, teaching myself computer and design skills, I landed a job in my late twenties. From that time up until I had my son in my early 40s, I worked solidly as a graphic designer. What sparked your interest in calligraphy, and what path have you taken to master the art form since that time (formal training, independent study, a combination of the two)? I guess I’ve always been fascinated by letterforms and was quite obsessive about my handwriting when I was young. As a print designer, my dream projects were always books. To be able to go and see a job coming off the press was a dizzying experience. The smell of the ink and paper, my idea of heaven! I was always captivated by the selection process and feel of paper. But after the birth of my son, I grew tired of the relentless pace of the design industry and decided that I didn’t want to return. 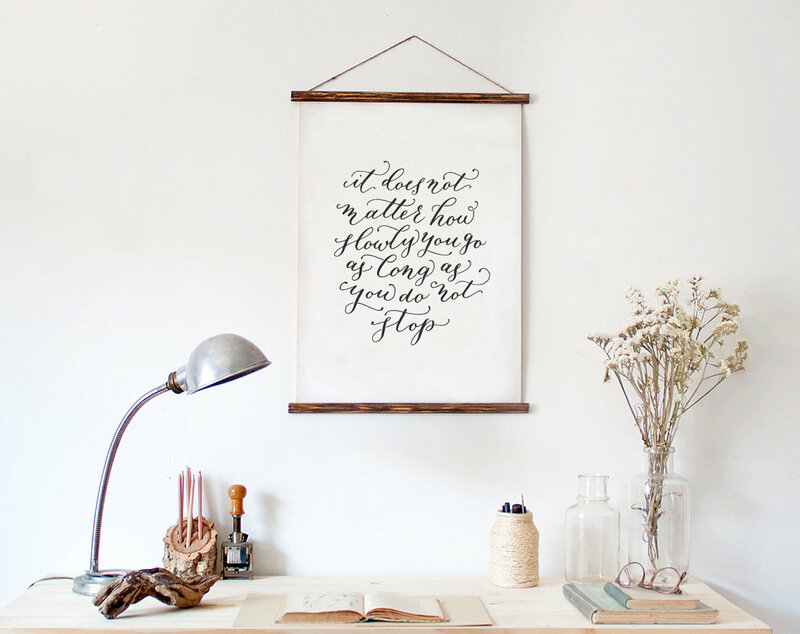 I really enjoyed staying at home and set up my own little studio designing typographic prints. I was using a lot of fonts that had a hand-drawn feel and I thought, hey, I want to learn to do that for real. I started with Molly Jacques’ Skillshare class, Introduction to Modern Calligraphy, and Molly Suber Thorpe’s book, Modern Calligraphy. I really threw myself into my newfound passion, but after a few months I hit a plateau. That’s when I sought out the services of a teacher one-to- one. They were able to point out where I was going wrong, and showed me seemingly simple things like correcting my posture and my hand-position. That was an epiphany! So I’m essentially self-taught, just as I was in my design career, but it’s my passion and I live and breathe it! If I could spend every minute of every day just practicing calligraphy, I would consider it a luxury! As a graphic designer and a calligrapher, where do you feel that calligraphy falls in the spectrum from fine art to design? That’s the wonder of calligraphy! It covers such wide ground that it can be appealing to anyone working in these fields. A good understanding of calligraphy provides a designer with a fundamental understanding of fonts and typefaces and how they are structured. A fine artist can take it to the other end of the spectrum and really experiment and layer letterforms until it’s totally abstracted. What are the three most important lessons you learned when establishing your creative freelance business? That really should read ‘lessons I’m learning’, as I am still working my way along that tightrope. Like so many creatives, I really don’t have a natural head for business. That’s what I’m currently pouring a lot of my energy into learning how to actually run my business. The first thing I’ve discovered is that I’m not a calligrapher/letterer, I’m a marketer and salesperson who happens to be marketing and selling calligraphy/lettering. Secondly, I think having some sort of network around you, or a mentor, is desperately important. It can be incredibly isolating working alone and that support network that I used to have in a design studio is missing. So be prepared to be the IT guy, the accountant and the PR person! I find the calligraphy/lettering community to be incredibly generous and supportive and it’s important to get yourself on forums and social media and ideally meet other lettering enthusiasts in person. Join a local association if there is one. And lastly, I would say make sure you charge what you’re worth and more importantly what it’s worth to the client. Do you ever experience creative block? If so, how do you combat it and stay motivated? Oh, all the time! Working to a conceptual brief is difficult and has always nearly sent me over the edge in a blind panic. I’ve learnt over time, that I need to sit on it for a few hours or overnight, just mull it over. If I’m in the middle of a project and I feel it’s not quite going to plan, I tend to walk away, do something else like have a cup of tea, look at an inspiring book or website, gardening, even cleaning! Just remove yourself from the situation, breathe and try and let inspiration come back in its own time. It inevitably will. Can you tell us about the most interesting, unusual, or difficult commission you’ve worked on to date? I was recently asked to go to a very swanky hotel in London to produce hand-brushed signs for the ten finalists of The Most Imaginative Bartender Awards. I had to be on site as no information about the cocktails was available until the morning of the event. When I arrived I discovered that the pre-printed boards (a background texture and the sponsor’s logo) were on a substrate that was impossible to write or paint on with any of the variety of mediums I had turned up with. I had to wait 3-4 hours for new ones to be printed. And there was a lot of indecision on the final spelling of names and ingredients. So in the end I had to produce these things in a massive rush for the 6.30pm deadline. We made it, but I didn’t really get a chance to take any photos – I only have shots of my roughs - and I certainly never got to sample any of the cocktails! Do you have a hidden talent or hobby that you don’t usually share? It’s been quite a while since I picked up a hook, but I did have real thing for crochet around the time my son was born. Maybe it was that nesting instinct, but I got pretty passionate about it. I even had a blog dedicated to all things yarn, and I’m pretty pleased with the stuff I made. I think I’m just drawn to really delicate crafts like that. It looks far more difficult than it actually is by the way. And one of my early creative roles was that of a florist. I worked for some major London florists for around two years and I still love arranging flowers. I even made my own wedding bouquet! Who are the designers – past or present – from whom you draw the most inspiration? Probably too many to mention here, but I feel particularly drawn to the work of more experimental calligraphers such as Luca Barcellona, Yves Leterme, John Stevens, Christel Llop and Ylva Skarp. I also love the work of mid-century designers such as Saul Bass, a pioneer of lettering, and I’m inspired by the illustrations of Andy Warhol and Jean Cocteau. Leanda's typographic graphic design work (below) illustrates her skill in working with letterforms both on and off the computer. Photography of Leanda by Peter Breach. Leanda began her journey in calligraphy following a long career as a graphic designer, both in London and Athens. Her desire to move away from computer-based design led her to explore hand-lettering, and she hasn’t looked back since. As well as working on commissions, Leanda is passionate about teaching the art of modern calligraphy. Born and raised in England – and now based in Surrey – she has a special affinity with her husband’s native land of Greece and spends every summer there.